SWSS Celebrates its 20th Anniversary! Salmo River Bull Trout populations are very low. Please release unharmed if you catch them. 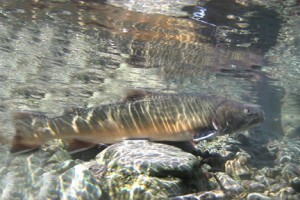 The Bull Trout (Salvelinus confluentus) is the largest fish now living in the In the Salmo River. They are a type of ‘char’ that can easily grow up to 1-metre (39”) in length and can live for 25 years. Beginning in the late 1990s, Bull Trout observation indicated that approximately 200 spawning (breeding) adults lived in the Salmo River Watershed. This low population flagged the fish as a conservation concern, and they were ‘blue-listed’, meaning the federal government recognized them as a threatened species. SWSS recognized that the Bull Trout in our watershed were in trouble as population numbers could easily go either way. Perhaps with our help the population could increase. Bull Trout have been monitored in Salmo River system in a variety of ways since 1999. Monitoring began with a Bull Trout Telemetry Project where 40 man-days were used to angle 10 Bull Trout over 50cm. Once captured, the trout had radio tags surgically implanted, then were allowed to recover before being released. The fish movements were then periodically tracked by boat, helicopter and vehicle, where river access was possible, to determine spawning areas and overwintering sites. The overall Bull Trout population was counted in a variety of ways: snorkel-surveys, fish fence enumeration, and electro-fishing were used to extrapolate abundance. 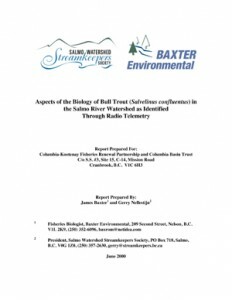 The project ended in 2001, concluding with Summary of the Third Year of Bull Trout (Salvelinus confluentus) Radio Telemetry in the Salmo River Watershed. The Bull Trout Studies were a “partnership wonder”, bringing together SWSS, Columbia Kootenay Fisheries Renewal Partnership (CKFRP), BC Hydro, Baxter Environmental, BC Ministry of Environment, Lands and Parks, Seattle City Power and Light, Frank Communications Inc., Mountain Water Research, and indirectly Human Resources Services and Development Canada. Sadly, in 2009, the Bull Trout population survey recorded only about 60 spawning adults. SWSS along with a number of other concerned citizens from industry, agencies, government, and community met to discuss possible reasons for the decline and to develop solutions to increase bull trout numbers. We are fortunate to have this small population of threatened Bull Trout in our watershed, they provide a focus and give the opportunity to learn more about the Salmo River Watershed as a whole. SWSS hopes it can garner the will and support to work toward an increase of the Bull Trout population in the Salmo River. 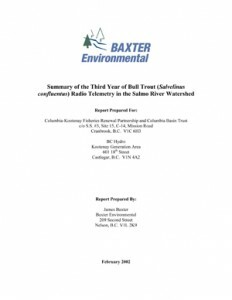 Summary of the Third Year of Bull Trout (Salvelinus confluentus) Radio Telemetry in the Salmo River Watershed; Baxter Environmental: James Baxter; February 2002; 21 pgs. In the summer of 1999 and 2000 a total of twenty bull trout were implanted with radio tags in the Salmo River watershed to determine the life-history and habitat use of the population. The specific objectives of the project were to identify major spawning, summering and overwintering areas, as well as to provide data on migration and spawning timing. A secondary objective was to determine if there was a migration to, or from, Seven Mile Reservoir by radio tagged bull trout. This report summarizes the third fall and winter of the radio tracking program. 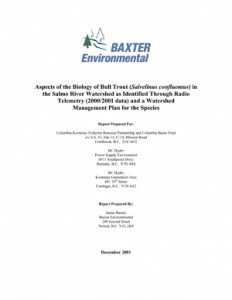 Aspects of the Biology of Bull Trout (Salvelinus confluentus) in the Salmo River Watershed as Identified Through Radio Telemetry (2000/2001 data) and a Watershed Management Plan for the Species; Baxter Environmental: James Baxter; December 2001; 117 pgs. Over two years (1999-2001) a total of twenty bull trout were implanted with radio tags in the Salmo River watershed to determine the life-history and habitat use of the population. The specific objectives of the project were to identify major spawning, summering and overwintering areas, as well as to provide data on migration and spawning timing. A secondary objective was to determine if there was a migration to, or from, Seven Mile Reservoir by radio tagged bull trout. This report also summarizes the current status of the Salmo River bull trout population, and makes recommendations as to future management requirements. 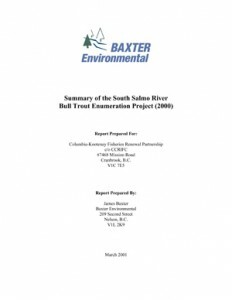 Summary of the South Salmo River Bull Trout Enumeration Project (2000); Baxter Environmental: James Baxter; March 2001; 20 pgs. An enumeration fence and traps were installed on the South Salmo River from September 11th to October 24th, 2000 to enable the capture of post-spawning bull trout emigrating out of the watershed, and to capture five additional bull trout for the ongoing radio telemetry project. During the study period, a total of fifteen bull trout were sampled through the enumeration fence, and five were radio tagged. In total, seven males and eight females were processed through the fence. The average length of males was 58.9 cm, while the average length of females was 52.2 cm. Two bull trout sampled at the fence were originally radio tagged in 1999. One was a male, and one was a female. Over the year the male grew 3.5 cm, and the female grew 4.0 cm. The only other fish caught at the enumeration fence was a 30 cm largescale sucker. We also used the project as an educational tool for local elementary and high school students. 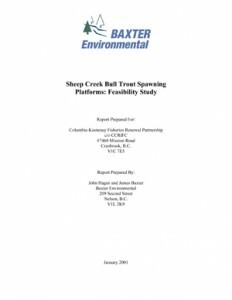 Sheep Creek Bull Trout Spawning Platforms: Feasibility Study; Baxter Environmental: John Hagen, James Baxter; January 2001; 22 pgs. Field staff of Baxter Environmental have suggested that bull trout spawning in the Salmo River tributary Sheep Creek may be limited, based on observations of apparent redd superimposition and hydrological factors that have limited gravel recruitment. Although spawning habitat limitation likely cannot be demonstrated directly, this report details a cursory feasibility study for potential spawning habitat enhancements. Aspects of the Biology of Bull Trout (Salvelinus confluentus) in the Salmo River Watershed as Identified Through Radio Telemetry; Baxter Environmental: James Baxter, Salmo Watershed Streamkeepers Society: Gerry Nellestijn; June 2000; 70 pgs. A total of ten bull trout (eight females and two males) were implanted with radio tags in the Salmo River watershed (nine in the mainstem Salmo River and one in Clearwater Creek). The average size of tagged fish was 57.0 cm fork length and 1972 g weight. Catch per unit effort averaged 0.44 bull trout per angler day, and post-surgery mortality was 0% as all bull trout underwent extensive upstream migrations to spawning areas. Bull trout began migrations to their spawning areas between July 15 and August 10 during a period of reduced decline in Salmo River discharge. Bull trout were tracked to a total of five spawning locations (the upper Salmo River, Clearwater Creek, Sheep Creek, the South Salmo River, and Stagleap Creek (tributary to the South Salmo River)), with one fish spawning in the United States of America (South Salmo River). During tracking four of the ten tagged fish entered the South Salmo watershed, with two fish utilizing the South Salmo River in the United States of America. Bull trout entered spawning tributaries as early as the first week of August, with spawning peaking in the first or second week of September. There was significantly more use of tributary habitat than mainstem habitat by radio tagged bull trout for spawning. Post-spawning migrations to overwintering habitat had generally occurred by the end of November, and it appeared that post-spawning mortality was 0% as all fish had moved significant distances downstream to overwintering areas. Overwintering habitat was limited to an 11 km section of the mainstem Salmo River between 13 km and 24 km, with some fish overwintering in the same pool in which they were originally tagged. Overwintering habitat was mainly in the form of deep pool in association with large woody debris or boulder. No tagged bull trout migrated into Seven Mile Reservoir, suggesting that the population is a fluvial population. 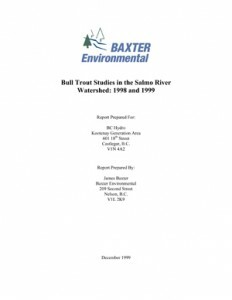 Bull Trout Studies in the Salmo River Watershed: 1998 and 1999; Baxter Environmental: James Baxter; December 1999; 57 pgs.